All local families are invited to attend this event which will focus on various family friendly museums and attractions that both Cleveland and Canton have to offer. Guests in attendance will experience live art demos including painting from Just Imagine Gallery (Canton, OH) and jewelry making from Cleveland Street Glass (Cleveland, OH). Chocolate samples from Malley’s Chocolates, jams and jellies samples from The Home Pantry, as well as hot chocolate and coffee from Carpe Diem Coffee Shop will be included with the free admission. Make and take art activities will include clay art facilitated by the Canton Ceramics Guild, button creation station and marbling wood cut-outs in the shape of Ohio using shaving cream. Participating vendor booths include the Cleveland Museum of Art, Cleveland Museum of Natural History, William McKinley Presidentail Library and Museum, Massillon Museum, Canton Charge/Cleveland Cavs, Canton Palace Theatre, Canton Ballet, Just Imagine Gallery, Stark County Library and more. The Cleveland Indians’ mascot, Slider, will also make an appearance and will be available for photos. Several artists from the CMA winter exhibit Continuum: Art of the Cleveland School and Beyond will be stationed near their works in the galleries to explain their creative process and answer any questions from attending families. of the exhibition will travel to ARTneo in Cleveland and be on exhibit from March 15 through May 17, 2019. Brent Kee Young, glass artist and Cleveland Institute of Art professor emeritus, has been recognized by scores of museums, galleries, colleges, and universities in the United States and Asia, which have displayed and acquired his work and invited him to speak, demonstrate and teach. In 2006, the Smithsonian American Art Museum’s Renwick Gallery acquired its second piece by Professor Young for its permanent collection. “Amphora….Save” is from Young’s Matrix Series, a construction of intricate and technically complex works he created by flame working borosilicate glass rods into layers of glass webs. In 2012 his work was published in 50 Years of Studio Glass, a selection of 50 top glass artists working world-wide. The Matrix Series exhibited at CMA is his latest venture with glass. All of the pieces from this series are flame worked borosilicate rods. They are fashioned to form an organic, interconnected structure of any shape. Young’s background in engineering comes through as he challenges himself to build, develop, and invent a new way of thinking, and then constructing, his objects. His pieces are object based, using familiar everyday objects – these include chairs, vessels, bags, ladders, etc., which pique his interest. In the Matrix Series, Young has chosen five objects that represent objects from Asian and Huari cultures (a pre-Columbian Huari (Wari) culture that predated modern Peru by some 1500 years). Martha Young’s work in fiber and other materials draws on a wide range of techniques, fibers and textiles from all over the world. Martha’s interest in fiber began at an early age when she learned to sew doll clothes and her own clothing. After graduating from San Jose State University in California with a focus in painting and art education, she found quilt-making and fiber to be her ideal media. experiences exposed Martha to the beauty and quality of vintage and contemporary Asian textiles and led to her interest and appreciation of their colors, patterns, and design aesthetics. The work presented in this show encompasses many different techniques and formats, but fiber is ever evident in all of Martha’s work. exhibitions in Paris, most prominent between 1748 and 1890. Here, hung in the floor-to-ceiling fashion of the great Salons, you can discover and explore works by some of the most prominent American artists — more than 200 pieces including works by Thomas Hart Benton, Childe Hassam, Winslow Homer, Edward Hopper, Maurice Prendergast, John Singer Sargent, Clyde Singer, William Sommer, Andrew Wyeth, Jamie Wyeth, and many more. This is just a small part of the more than 1,500 pieces in the CMA Collection. thank them for their generosity and their commitment to preserve and protect the beautiful works of art in CMA Collection for all to enjoy. 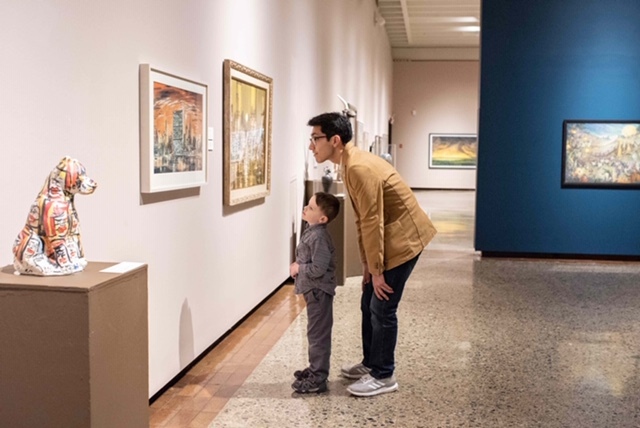 The Canton Museum of Art is one of Ohio’s premier museums for an exceptional visual arts experience, recognized for powerful original exhibitions and national touring exhibitions focused on American art. The Museum’s innovative education outreach programs, classes, and workshops serve thousands of students of all ages. CMA’s acclaimed collection focuses on American works on paper, primarily watercolors, and contemporary ceramics. Founded in 1935, the Canton Museum of Art makes the discovery and exploration of art accessible to all, with more than 42,000 visitors each year. Visit cantonart.org, follow the Museum on Facebook, or call 330.453.7666 for more information.